On November 16, H.E. Mme. 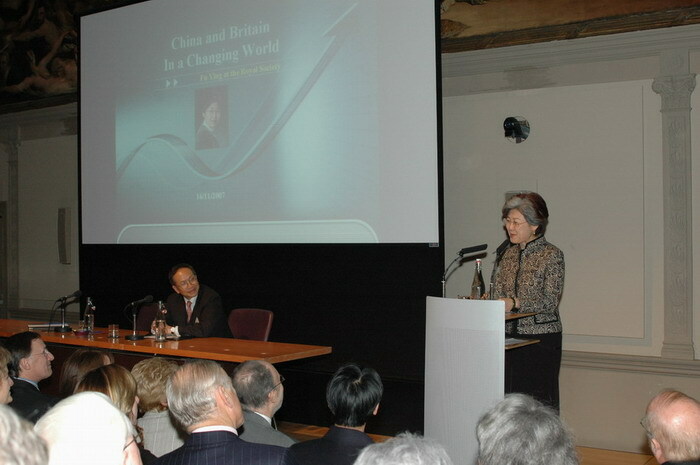 Ambassador Fu Ying delivered a speech named "China & UK in A Changing World" (full text) in the Conference Hall of the Royal Society for the Encouragement of Arts, Manufactures and Commerce (RSA). 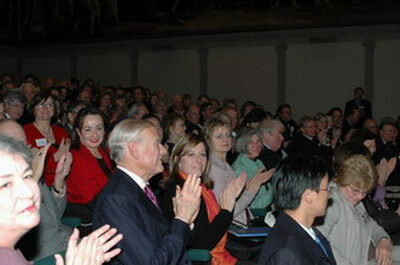 Gerald Vinten, Chairman of RSA London and more than 200 members attended. Fu Ying took Zhong Guan Cun and Yiwu Small Commodities Market as examples and introduced in a graphic manner the huge changes in China since the start of reform and opening up more than 30 years ago. She denoted that though China has made great achievements in its development, there are still a lot of problems and challenges. Fu Ying made a brief introduction of core messages delivered to the world by the 17th CPC Congress, such as sticking to the scientific outlook on development and continuing the road of reform, opening up and the path of peaceful development and going all out to make the 2008 Beijing Olympic Games a success. Fu Ying highly evaluated the current situations and prospect of Sino-UK relations and concluded their characteristics and potentials. She stood for expanding service trade and encouraging more Chinese enterprises to invest and do business in UK and promoting mutual understandings between the two peoples. The speech of Fu Ying was supplemented by various slides, and she answered questions of the audience after the speech (Q&A). 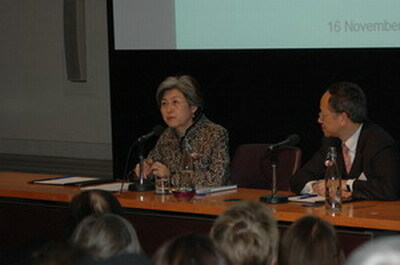 The speech was warmly received by the audience who thought the speech was informative, candid and impressive. The Royal Society for the Encouragement of Arts, Manufactures and Commerce (RSA) was founded in 1754. It has more than 7,000 members now, most of them are well-known pubic figures. RSA commits to the innovation and development in arts, manufactures and commerce. Karl Marx and Charles Dickens were former members of RSA.